Broad Street is arguably the heart of Richmond’s dynamic history. It is home to numerous theaters, museums, and retail stores, and has been since it was constructed in early Richmond times. The street is now 15 miles long, but was only a small dirt road at its inception. Even from the beginning Broad Street housed the city’s main forms of transportation, and these modes were only to improve and expand as time went on. The trains of the Richmond, Fredericksburg, and Potomac Railroad ran down the middle of the street until the late 1800s creating easy access to downtown Richmond. Broad Street has served as the commercial center of Richmond practically since its creation as commercial buildings and businesses have been built on it throughout the city’s history. Broad Street started in downtown Richmond, it later expanded to include the suburbs where it remains in current times. The street is dedicated to retail and shopping, even in the suburbs, as the street is lined with malls, shopping centers, and common shops. As Richmond moved west, Broad Street expanded, and, accordingly, so did the retail district of the city. The street moved forward to expand most of the way through Henrico County where Short Pump Town Center now stands, which includes many leading retailers. 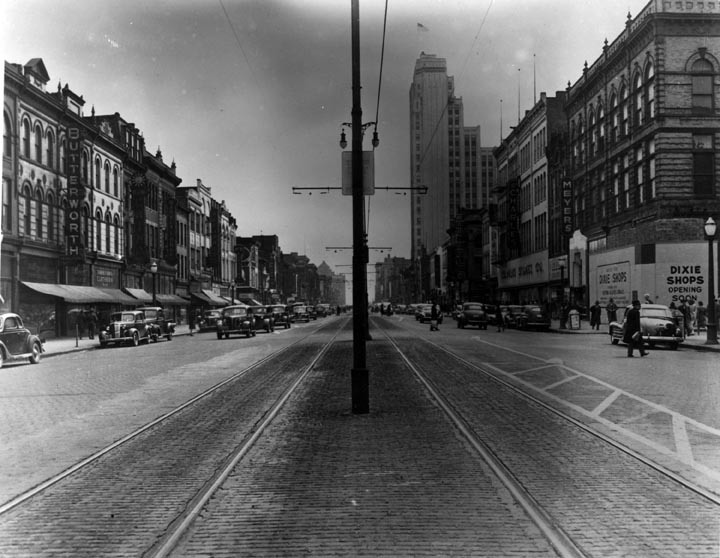 From its earliest days Broad Street has housed the theatre district called “Theatre Square,”[i] the retail district, and was a center for transportation. Broad Street doesn’t seem to end at Short Pump, it gives the appearance of infinite length and importance. Broad Street represents progress, and has since it was built. It started off as “a country road with corn fields and cow pastures on either side and here and there a house”[ii] and has grown to be the commercial center of the city of Richmond. It started as a small dirt road and eventually spread to the end of the county. Broad Street, because of its central location impressive attributes, became one of the focal centers of Richmond as well as a commercial center. It was built in a long, straight line in order to enhance the idea that it was in fact the commercial center. Being able to see all along the road easily influenced the people walking down it to feel as though it was the hot spot of the city. The idea of “linear perspective” is that when an object looks imposing and long, it gives it an air of greatness and importance. [iii] This idea most likely adds to Broad Streets seeming grandeur. “Buildings are appropriated in a twofold manner: by use and by perception” and roads are no different. [iv] Perspective completely changes a person’s view of a place or idea, and photography helps to enhance these perspectives. Photography can be used to display a place in a certain way. Vanishing points can demonstrate the progress of a place, specifically Broad Street as its structure and use complement each other perfectly. The picture highlights Broad Street’s length and size, as it is not only long but wide as well. When it was first built Broad Street was just a country road with nothing to pronounce it special or different except perhaps its central location. Because of this advantageous location, it was thought to be a prime location to build railroads and streetcars. This idea became even more pronounced when shops sprung up along it with no signs of ever stopping. Until about 1800 Broad Street only extended to First Street, but after this time, Broad Street and its business moved westward. [viii] This photograph mirrors the actual progress that defined Richmond and specifically Broad Street and portrays it in a picture through the vanishing point. The vanishing point matches “the visual experience of the world” to the “illusion we accept.”[ix] The vanishing point in the far distance of this picture defines the advancements and depicts the physical improvements and expansion of Broad Street itself. The camera “introduces us to unconscious optics” so when we see Broad Street through a vanishing point, it allows us to see the impressiveness of the road. [x] We are able to expose this “unconsciousness” through photography; it enables a viewer to see Broad Street as a place of progress and commercial achievement. Progress, however is not all linear and business related as Broad Street might have one believe. One district of Broad Street seems to be a more residential part of the road with no business advancements to speak of. Off in the distance a steeple is shown and trees line the street on either side. Most people think of Broad Street as no more than a commercial center, because it is portrayed as such to the general public. This image shows that all is not what it appears, as this looks like a relatively residential neighborhood, right where the center of the commercial city is supposed to be. However, the mercantile area of Broad Street is visible just as the view disappears, showing that this industry is always present and looming, even in the residential areas sections that are slightly removed. The vanishing point being the beginning of industry on Broad Street highlights the fact that even if not physically present, it defines the immediate and surrounding areas of the street. Broad Street’s residential area used to be west of the city. As time went on, however, the commercialism of the city of Richmond diminished and moved west. The business of Broad moved west, ruining whatever chances the street had at becoming a suburban place. 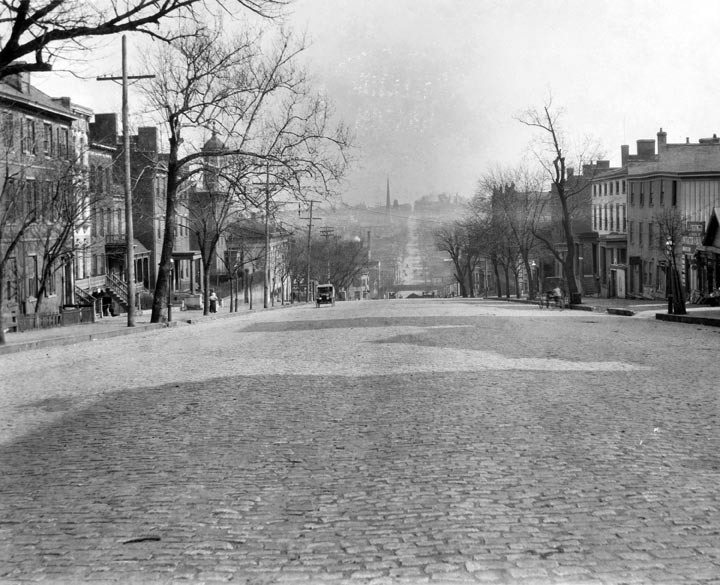 Broad Street has been the center of Richmond since its creation and has been the center of Richmond’s progress as well. 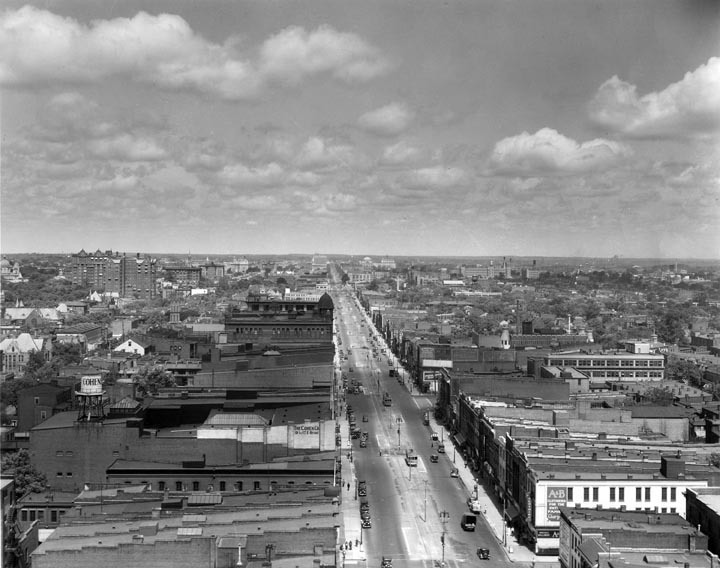 Broad Street started off as a small, dirt, country road and expanded and grew as the city did. Many people frequented the road as at first it was a good road to travel on, and then as Richmond became more populated and civilized, it became a place to spend time. City hall, the theatre district, shops and railroads all sprung up along Broad Street. As attractions popped up, the street continued to grow until the center of commercial Richmond was said to be located there. Despite the fact that Broad Street began as a commercial site, rather than evolving into one, businesses on Broad Street boomed and continue to do so westward, and as a result it is an irrefutable symbol of progress.. The pictures display Broad Street as a progressive destination simply by presenting the street in a linear way. The road is imposing, almost overwhelmingly so, because of the sheer number of residential and commercial buildings that reside there. The vanishing point in the pictures illustrates the success that Broad Street has been home to, and the progress yet to come. [i] Eckenrode, H. J. Richmond, Capital of Virginia; Approaches to Its History,. Richmond: Whittet & Shepperson, 1938. [iii] “Perspective.” Columbia Electronic Encyclopedia 6 (July 1, 2010): 1. [iv] Benjamin, Walter. “The Work of Art in the Age of Mechanical Reproduction,” Illuminations. London: Cape, 1970, 217-251. [v] “The Work of Art,” 220. [vi] Past and Present, 527. [vii] Past and Present, 471. [viii] Stanard, Mary Newton. Richmond: Its People and Its Story. Philadelphia: J.B. Lippincott, 1923. [ix] Dundas, Judith. “Fairyland and the Vanishing Point.” The Journal of Aesthetics and Art Criticism 40, no. 1 (Autumn 1981): 82-84. [x] “The Work of Art,” 237.